Yesterday(October 15th) Ellie Bamber attended different photocall & premiere for Les Miserables during the 2018 Cannes Mipcom in Paris, France. 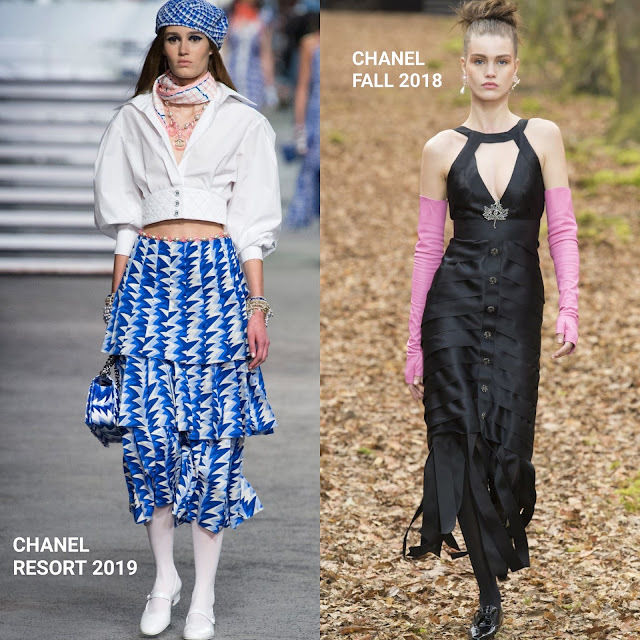 Ellie wore CHANEL on both outing. For the photocall, she wore a RESORT 2019 white leather panel crop top and blue printed tier skirt. Her ensemble was styled perfectly with white JIMMY CHOO ankle strap pumps. For the premiere and opening gala, she wore a FALL 2018 black ankle length tier dress, featuring a v-neckline, a center button closure and a fringe hem. An up-do and black sandals finished up her look. While she looked great in bith looks, the first was easily my favorite. Which Chanel was yours?